In the first of this two-part series, I covered the new CSS3 structural pseudo-classes, which target elements according to their position in the document tree or their relation to other elements. In this article, I’ll review the remaining pseudo-classes introduced in CSS3: the state-based, target, and negation pseudo-classes. While structural pseudo-classes rely on an element’s relative position, state-based pseudo-classes target elements according to their state, such as whether an element is active or focused. You should already be familiar with the idea of state pseudo-classes (like :link, :visited, :hover and :active), which were introduced in CSS1 for anchor (<a>) elements. In CSS2.1, the :focus pseudo-class was introduced, and it expanded state-based selectors beyond hyperlinks to form elements like input and textarea. CSS3 brings three more pseudo-classes you can use to target UI states for form elements: :disabled, :enabled and :checked. With the state-based pseudo-classes, the browser applies the selector only when the specified state is true in the UI. In the following example, the styles specified will render on the screen only when the user hovers over the link. All other link states won’t render these styles. For both approaches, most browsers use a default presentation for disabled inputs, where the field border is slightly grayed out compared with the enabled input, as shown below. 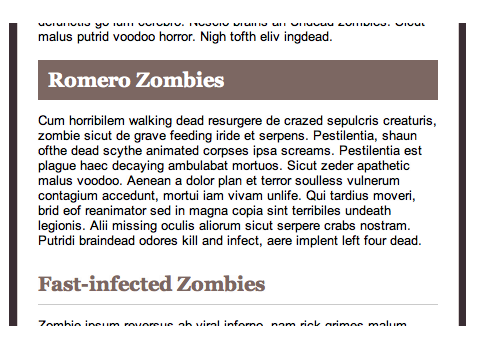 However, you can use the :disabled pseudo-class to override this default style and obtain the results shown here. Which selector you use ultimately depends on your project. Because the default state of form elements is enabled, I’m not sure when I would need to use this selector. An element selector would work just as well, and maybe better, depending on the project. But for purposes of demonstration, consider a short form with radio buttons that includes an Other option that lets users enter their own value in a text input. The HTML for this form is shown below, and below that is the form. The :checked pseudo-class targets radio and checkbox inputs that are selected. This allows you to style elements that are preselected by the developer via the checked attribute or selected by the user in the UI. The :checked pseudo-class might be useful in a matrix or long list of radio buttons (or checkboxes) in which a user could have difficulty determining which option is selected. For the sake of brevity, let’s look at how :checked can be applied to a simple opt-out form on which a radio button is preselected (see Figure 6). 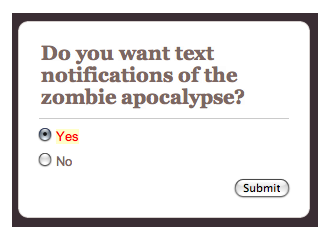 Unfortunately, most browsers restrict styling of radio and checkbox inputs. 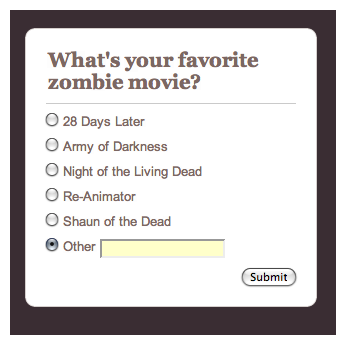 In these cases, the styles specified with the :checked selector simply won’t display. Of the browsers I use, only Opera/OS X delivered the results shown, and frankly, it’s just ugly and would probably confuse the user. However, you could use the :checked pseudo-class along with the adjacent sibling combinator to style the label text for a checked radio button. Here’s the CSS. You can see the results below. 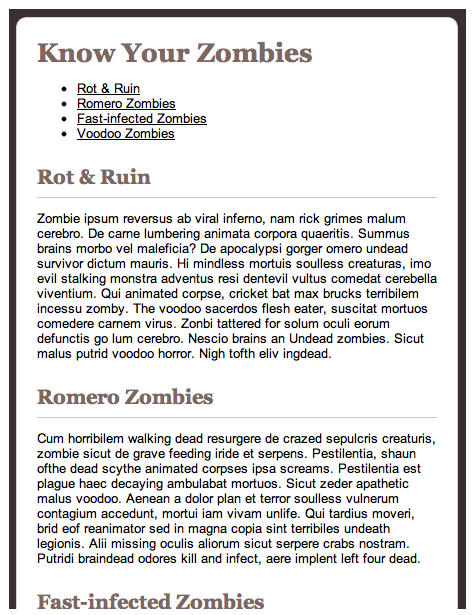 CSS3 also includes a few new pseudo-classes that aren’t structural or state-based. The :target pseudo-class selects an element with an id that is linked to by using a fragment identifier. Fragment identifiers appear at the end of a URL, indicated with a hash mark (#) followed by an anchor (<a>) name or element id. After I have the HTML structure in place, I can style the h2 elements to have a different appearance when a user jumps to a section via the table of content links. Here’s the CSS, with the results shown below. Referred to as the negation pseudo-class, :not(x) targets elements that are not matched by the selector (x) specified within parentheses. The syntax for :not(x) allows virtually all types of selectors to be specified, from simple element, id or class selectors to combinators and other pseudo-classes. It’s easy to look at these pseudo-classes (and those covered in Part 1) and wonder why you would use them in favor of the (arguably) more straightforward selectors. The answer is tied to the project you are working on. Sometimes, a CMS will limit access to markup, which means you can’t add ids or classes. The same is true for some legacy systems. And sometimes unique situations come up where these pseudo-classes make sense. The goal of understanding these selectors, at least for me, isn’t to pick one and use it exclusively. Instead, it’s about building an arsenal of options you can use for any situation or project. As I detailed in Part 1, all modern browsers, including Internet Explorer 10 and 9, support CSS3 pseudo-classes. If you are targeting an older browser version that offers limited or buggy CSS3 selector support, you will need to use a polyfill like Selectivizr. It’s also worth mentioning that browser processing of CSS3 selectors is comparatively less efficient than that for other selectors. Again, what you use should always come down to your project. If you need help evaluating the performance of your selectors, check out CSS Lint and the CSS Test Creator. Also, I very highly recommend Zoe Gillenwater’s Stunning CSS3. In this book, you get lots of practical examples of pseudo-classes, along with a ton of other fantastic CSS3 information and resources. See also SitePoint’s CSS Reference and CSS books. Emily Lewis is a freelance web designer of the standardista variety, which means she gets geeky about things like semantic markup and CSS, usability and accessibility. She writes about web design on her blog and is the author of Microformats Made Simple and a contributing author for the HTML5 Cookbook.